It is important to act quickly when you know that you are in need of sewer repairs in Austin. The sooner you act, the better you chances for avoiding complete sewer pipe replacement and more damages. Waiting will obviously only do more damage. Yet the results issues from having blockages and breaks in your sewer system can be unimaginable. This can literally lead to flooding or compromising the structural integrity of your residential or commercial building. You can rest easy though because you have found the right team of experts to take care of the job for you. Here at Moore & More Plumbing, we take this line of work seriously and that is evident from the results we get. There are so many things that can pose a threat, when it comes to the condition of your sewer. Tree roots, ground settling and natural aging are just a few. The good news is that our Austin plumbers can help you mend the damage and get you back up and running again, in no time. Want to know the best news of all? We are able to utilize trenchless sewer repair and replacement services. This is one of the reasons that we are the number one plumber in the local area. Trenchless is a method that eliminates the need for heavy equipment and for destroying your entire yard to carry out the work. Less Intrusive – Being able to repair or replace your sewer without the need to dig up all of your yard and landscaping is benefit enough. Yet this also helps save you money because you do not have to go back and pay to have your lawn or landscape fixed, after the plumbing work is done. Saves Time – The old approach to moving in massive equipment and tearing up the entire yard to take care of this work was also a lengthy process. The trenchless approach literally cuts the service time down to a fraction of the old technique. More Cost-effective – Obviously, by making the job less intrusive, this saves time as well as money. By making the job easier to carrier out, this makes the price more affordable. We look forward to meeting with you and providing you with the expert advice and information you need. This will help you to make important decisions about your need for plumbing services in Austin. 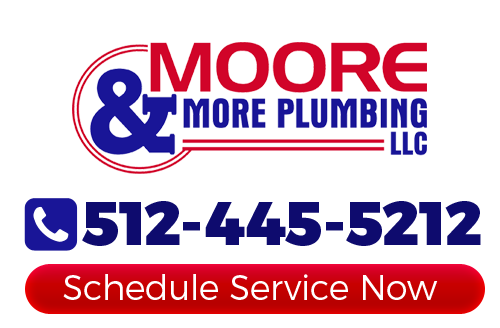 Moore & More Plumbing is the only name that you need to know for superior quality workmanship. Give us a call today to find out more about what we can do for you. If you need sewer repairs in Austin or the surrounding areas, please call 512-445-5212 or complete our online request form.